Liverpool’s managerial maestro Rafa Benitez turns 59 today and I honestly can’t think of many other former managers who are held in such high regard by the fanbase with the Spanish gaffer adored by the fanbase despite currently managing one of Liverpool’s Premier League “rivals”. Born in Madrid in the 1960 during quite a difficult time in Spain’s history, Spain was at the time under the rule of ruthless dictator Francisco Franco, to parents Francisco (no connection to the dictator) and Rosario, Rafa grew up in Madrid as the middle child of the family. Despite his father being an ardent supporter of Atletico, his mother was a lifelong Real Madrid and whilst as a child Rafa wasn’t 100% swayed by either side, his decision to join Madrid’s youth set-up at the age of 13 effectively made his mind up – even his father was slightly swayed to the white side of Madrid because of him. A brilliant player at youth level who could have well gone all the way to the top, Rafa’s footballing career was stunted by a knee injury at the age of 19 whilst playing at a national tournament and thus wasn’t able to make the expected step up to Madrid’s Castilla (their reserve side). 6 years of lower league football come and went for Rafa, who was still a decent player at that level, but would never realise the potential he had as a teenager, though we can’t complain as such a cruel learning curve likely made him the manager he is today. Immediately after being forced to retire the still young Rafa threw himself into management and he spent over 8 years working his way up through Real Madrid’s youth system and even served at the assistant first-team coach during the 93/94 season. His first big test came in 1995 with his first venture into senior management at Valladolid though the results were hardly spectacular with his dismissal coming after just 2 wins in 23 games. Things didn’t improve much the following season at Osasuna with 2 wins in 9 games getting Rafa the boot again, though it was during this tough time that he met Pako Ayestreran, his future go-to assistant. A few difficult years passed before Rafa got his big break at Valencia and from that point onwards the Spaniard never looked back with his team implementing an exciting style of attacking football that would lead Valencia to their first title in 31 years, not bad for his debut season. The following season saw form slip and a disappointing 5th place finish attracted some pressure before another title win the season after certainly made up for it. An internal bust-up with the director of football saw Rafa resign in June, joining Liverpool just 2 weeks later to replace Gerard Houllier. Rafa kicked off his time at Liverpool by convincing club hero and captain Steven Gerrard not to join Chelsea, though he couldn’t convince striker Michael Owen to reject a move to Madrid. The additions of his countrymen Alonso and Garcia strengthened the decent squad that he had already inherited from his predecessor but eleven away losses in his debut season left Liverpool with a 5th place finish, behind Everton of all teams. It was in Europe where Liverpool had looked their best under Rafa during this debut season though with a loss to Chelsea in the League Cup final showing some signs of progress under the Spaniard before Liverpool’s infamous Champions League win over AC Milan sealed Rafa into Liverpool folklore, less than a year after he joined the club. To this day those games at Anfield during the journal to that final are still talked about with their atmospheres being amongst the best in the modern era. The immediate signing of Pepe Reina showed that Rafa wasn’t content with 2 finals in his first season and the later additions of Sissoko, Crouch and Agger only proved that with further with Pepe Reina being a major reason why Liverpool beat West Ham in the 2006 FA Cup final. Poor league form the following seasons saw some pressure grow but Liverpool’s consistently good form in the cup competitions did buy Rafa more time to deliver that elusive league title, though the arrival of Hicks and Gillet spelled the start if the end for Rafa at Liverpool with the Spaniard officially departing the club on June 3rd 2010. The reasons for Rafa’s departure aren’t fully known but it is through that the owners’ interference in transfer business as well as consistently allowing key players to leave did play a major part. 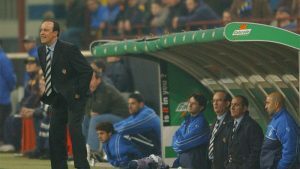 Since leaving Merseyside the Spaniard enjoyed success at Inter Milan, Chelsea and Napoli, as well an ill-fated stint at Real Madrid, before taking the Newcastle job, where he has turned Newcastle into a mid-table Premier League side whilst working on a shoestring budget. 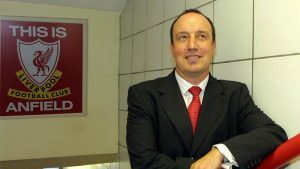 A major supporter of the ‘Justice for the 96 movement’, Rafa has his roots firmly in Liverpool with his family still Living here and whilst he may be managing one of Liverpool’s league rivals, Rafa is adored by the Anfield supporters and his contributions to the club and the city as a whole will never be forgotten.